In the heart of Carnaby Street, the funky epicenter of the swingy sixties is Kingly Court. 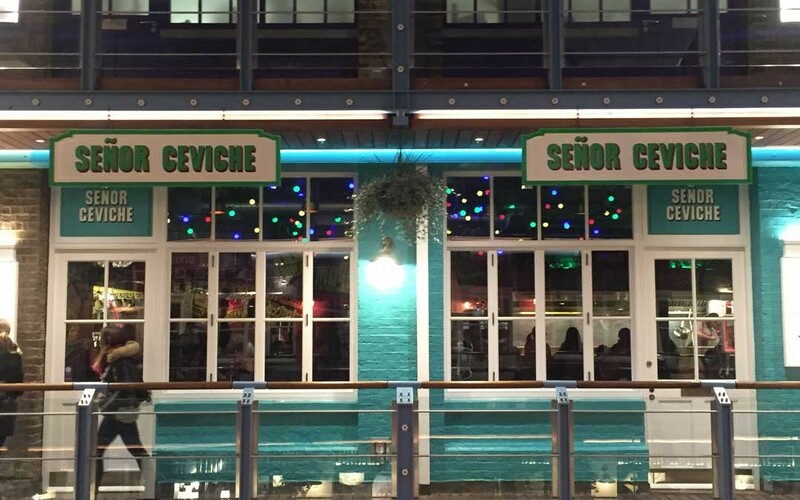 Senor Ceviche is located on the first floor of this complex of bars and eateries, with a funky modern twist. I could not think of a better place for English chef Harry Edmeades, who after falling in love with Peruvian cuisine and running a very successful pop up, decided to take the plunge and staying put in central London, bringing the vibe and the food of Barranco, the Shoreditch of Lima. On arrival on a cold winter evening, just the colour outside of the place lightened up my spirit, then the music and the vibe of a full house took me straight back to my visit to Lima. Harry was in the house and had a chance to transfer to me his passion for Peruvian cuisine and his time in Peru. His passion was reflected in the friendly, happy atmosphere of the place. You can read the way how a place is run, by the vibe you get from the staff, we had the pleasure of being served by the beautiful Etienne from Brazil, who was eager to explain the menu and get us drinks as fast as they were made, which I think is a winning formula in a restaurant. 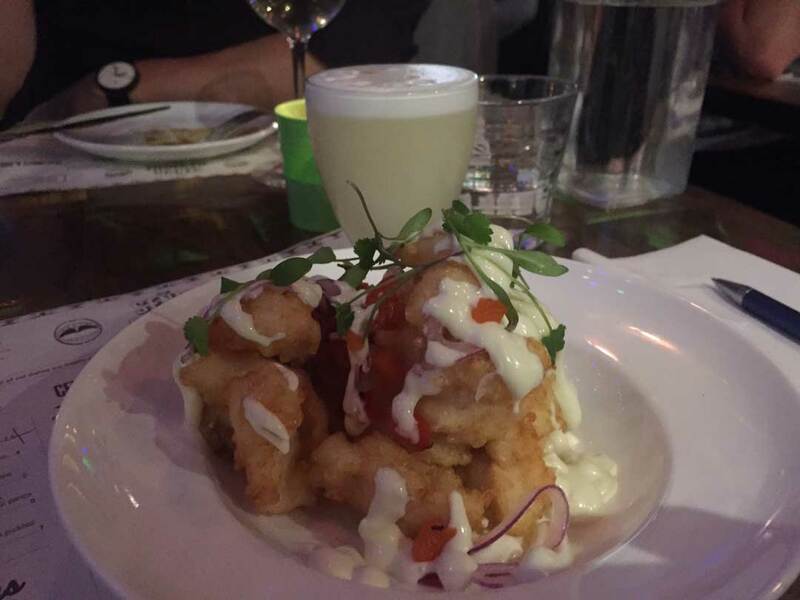 The pisco sour was as good as the one you get in Barranco, the perfect balance of sweet and sour and had a good kick that was accompanied with crunchy roasted corn with chilli. The open kitchen lets you to have a glance of the chefs on a busy service, concentrating on the details of what is going on the plate. 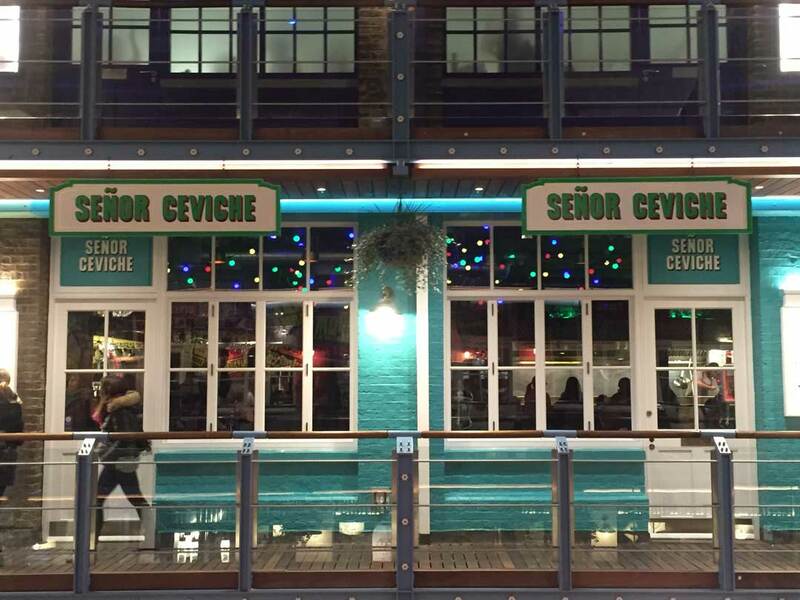 The menu features street food, ceviches and classic Peruvian bbq, a true journey of Peruvian food. The jalea mixto had the perfect tempura batter on the squid, prawns and cod, served with pickled Jalapenos mayo, which I would prefer more fiery. The house ceviche Señor Ceviche lived up to its reputation, I do love the avocado with leche de tigre combination, to follow we had beef anticuchos with aji rocotto and aji limo chimichurri, that really showed a great flair from the kitchen, a great combination of flavours with the perfectly cooked and smoky beef. This was accompanied with the zingy quinoa and roasted vegetable, choclo, cancha salad, perfect marriage with healthy end. We shared a passion fruit posset to finish our meal with a promise to came back to have the super chicken that every time that passed by our table our eyes followed it to its destination. Señor Ceviche is a happy place, great addition to the London culinary scene, the kitchen is serious about its food, the floor has a happy vibe a bit of Lima in the heart of Soho, this proves my theory that you need to be passionate about your food and not only Peruvians can bring their flavours to London.